Venom. It’s happening. Yes! Finally. What we’re talking about here is probably the coolest comic book villain of all time. The only character who rivals him in that department is Carnage, and guess what? Carnage is probably in this movie too! Venom is the big brute with a warped mind and an ink-black alien symbiote suit that acts like a thick mass of tar swallowing a man whole. Eddie Brock, the man under the suit, is angry and jealous and filled with fury before getting the suit. The suit only gives him the means and ability to rage at the world. They tried using this villain before. Once. It was in Spider Man 3, the worst Spider-Man film to date. Director Sam Raimi was forced by the studio to jam the character in even though it didn’t fit with the story. But that’s not even the worst part. The worst part is that they made Venom all wrong. Eddie Brock was played by Topher Grace. He was a thin, weak, annoying kid. They wanted to make him an age-appropriate romantic rival to Peter Parker, but c’mon. Venom is supposed to be huge and buff and intimidating. What they gave us in that movie was the exact opposite. And now, a full decade later (Spider Man 3 came out in 2007,) it looks like they might actually be getting it right. 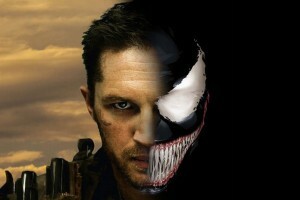 Tom Hardy is Venom. The same actor who gave us Bane in the Dark Knight trilogy. How funny is that? The two most iconic big, muscular, all-black wearing villain roles, and Hardy’s the one bringing us both. Considering how great of an actor he is, there’s no problem with that at all. If there’s any doubt about Hardy’s acting skills, just check out the movie Locke, in which the actor sat behind the wheel of a car for the entire film using speaker phone and ended up giving us one of the most compelling films of 2014. Check out Warrior or The Drop. Hardy is a machine. They couldn’t have gotten a better actor for this role if they tried. Getting back to the Venom movie, there’s also Riz Ahmed on hand here, most likely playing the villain, (please, please, please be Carnage.) Ahmed is a rising star who was so good in the HBO mini-series The Night Of. Playing the villain in the Venom movie just might be his biggest break yet. The only thing I’m not thrilled about with this film is the director. Ruben Fleischer. This is the guy who has now had one hit and two misses. Zombieland was a success story, buy Fleischer followed it up with 30 Minutes Or Less and then Gangster Squad. Both were pretty lousy. Now this director is back to square one. His record is basically back to zero, with the bad cancelling out the good. Maybe this will mean he’s hungry again and has something to prove. Considering the project and the actors involved with the Venom movie, all the building blocks are there for him to do exactly that.